For over 15 years, our customer has established itself as a key player in the timber/saw mill industry, servicing its clients in Burpengary and throughout QLD. 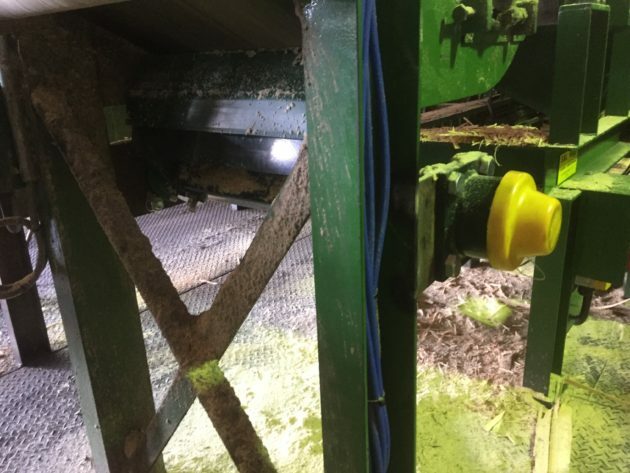 The Super-G Secondary Belt Cleaning System was accessed and agreed as the best option in addressing the saw mill’s belt cleaning challenges. The recommended Super-G Secondary Belt Cleaner was easily installed on the site’s laser scanning station due to its ability to utilise a ‘pass-through’ mainframe design allowing timber plants to freely fall through it, keeping operations running with little to no maintenance resources and waste materials. The Super-G uses the same heavy duty mainframe and Perma-Torque™ spring free urethane tensioning system as the Eraser primary belt cleaning system, incorporating a corrosion resistant, fully sealed and dust proof polyurethane tensioner, providing safe, reliable blade adjustment for optimum belt cleaning. Due to the effectiveness and performance of the installed Super-G Secondary Belt Cleaner, the site’s conveyor belt is now only cleaned at the end of the day, saving maintenance and labour costs. A cleaner conveyor belt has greatly improved scanner accuracy, thereby minimising the level of material wastage. The site now experiences uninterrupted production throughout the day, down time has now been eliminated. A reduction in operational costs and processing time per log has also been achieved due to the Super-G installation.